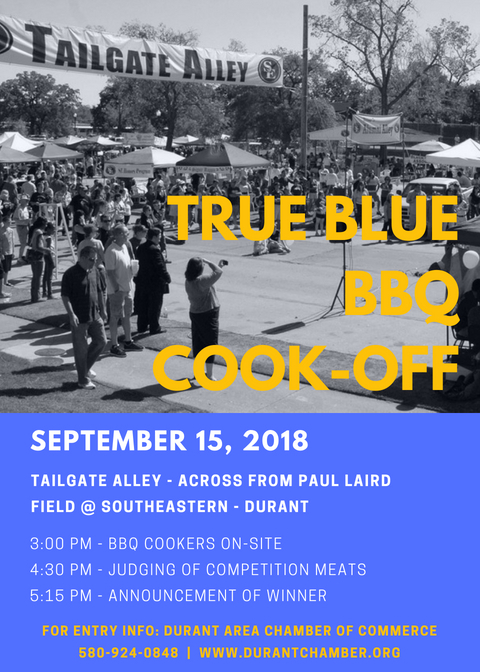 Join us for the annual True Blue BBQ Cook-off and Tailgate Party on Saturday, September 15, 2018 at Southeastern's Tailgate Alley (2nd & University in Durant). Cookers must be on-site no later than 3:00 p.m. Rules, Regulations and Entry Form can be found at the Durant Area Chamber of Commerce or downloaded here. You don’t want to miss this fun day of great BBQ and tailgating fun before SE Football kicks off at 6:00 p.m. at Paul Laird Field.